Other than a thin storyline, the film really is about four friends navigating Hollywood and all it’s "trappings". I'm not sure why studios think it's a good idea to take every successful TV show and make it into a feature film. I understand they feel it will be an easy moneymaker with a "built in audience", but too many times they come into it with a half-cocked script that doesn't do the show justice. While Entourage: The Movie isn't that bad, it certainly doesn't stand out as an exceptional work of art. Just like the TV show, Entourage: The Movie follows movie star Vincent Chase (Andrien Grenier; The Devil Wears Prada), his friends Eric (Kevin Connolly; Secretariat), Drama (Kevin Dillon; Hotel for Dogs), and Turtle (Jerry Ferrara; Last Vegas) and his former Manager, Ari Gold (Jeremy Pivens; Mr. Selfridge). Gold, now the head of a major movie studio, wants Vince to star in his latest film, "Hyde". Vince will only take on the role if he can direct the film as well. After many months and several budget issues, Gold must put his reputation on the line to help Vince finish the film, which is sure to be a blockbuster. Other than a thin storyline, the film really is about four friends navigating Hollywood and all it's "trappings". With all the parties, excess and wheeling and dealing, it all seems a little over the top. However, based on what creator and Director Doug Ellin stated in the extras, it seems that the show and movie were accurate depictions of what Hollywood is really like. If that is true, then I can't imagine living in that environment everyday. The cast is good enough in their roles but certainly not Oscar worthy. The characters are stereotypical depictions of what a layperson would think a Hollywood actor, his entourage and his manager would be like. There are so many celebrity cameos in the film that it gets to be a little over the top and campy. The extras are really disappointing, including an unfunny gag reel, two features on the actor who plays Ari Gold's son (spoiler –it's Ellin's son), deleted scenes, and behind the scenes of shooting the movie Hyde, which actually gave me some idea of what the movie in the movie was supposed to be about since I didn't get it from watching Vince's rough copy. Even though the Blu-ray is in 1080p High Definition video, I felt some of the scenes were grainy. The opening sequence on the yacht, though, was clean and crisp. The DTS-HDMA 5.1 audio was really an enhancement for this film due to the nature of some of the electronic music used for the soundtrack. 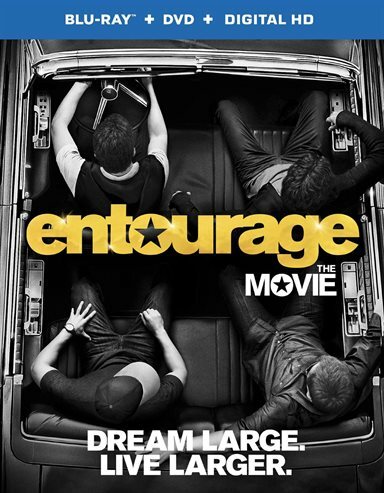 Download Entourage from the iTunes Store in Digial HD. For more information about Entourage visit the FlickDirect Movie Database.